Rustic Bedroom Furniture, A Guide to the Best Frames and Sets of 2018! If you are looking for rustic bedroom furniture to complement your bedroom, then we have selected the best items that you can buy online from Amazon. Rustic furniture can transform your room into something more rugged, earthy and natural looking. The furniture that we have reviewed will bring an organic look with warmth and simplicity to your bedroom, nothing overdone, just beautiful furniture! 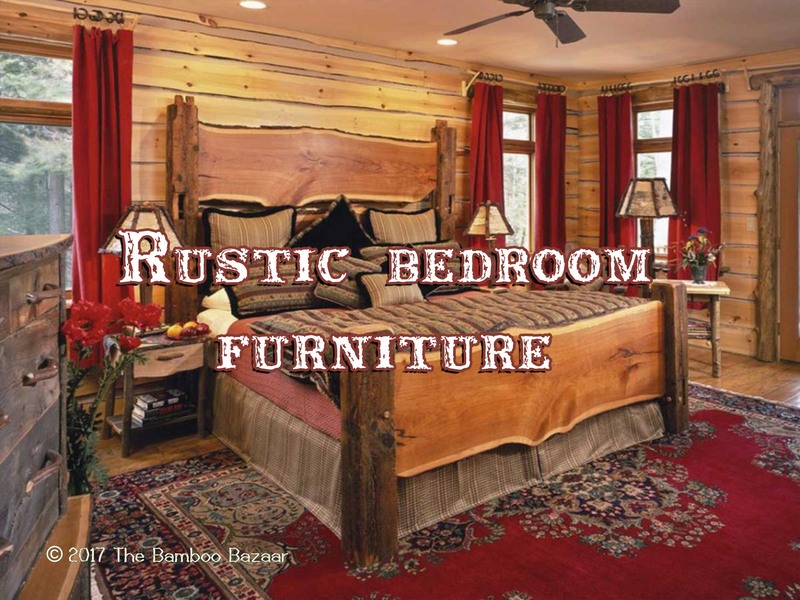 We have covered most of the items including rustic beds, rustic bed frames, rustic bedroom sets and just about every other type of rustic furniture for your bedroom in this guide. There is no best or worst in this review, but each has been given a guidance rating out of five. My first pick is a complete five-piece rustic bedroom set which includes a six drawer dresser, mirror frame, five drawer chest, three drawer nightstand and a log rustic bed. The whole set is handmade in the USA and all the pieces are made from solid pine. If you are looking for a rustic look in your bedroom, then this bedroom suite could easily be your first choice. The dresser and the drawers are already assembled, and all you need to do is place them right where you want them. The only piece of furniture that you need to put together is the bed. Like any other bed, just put the side rails into the headboard and the footboard. The good thing about this manufacturer is that you can request to have this suite in a different finish. You can also request to add or swap an extra item as well as remove any unwanted piece. My next choice is a handmade rustic bed frame and headboard made from reclaimed wood. Every piece of furniture is handcrafted by the Pereida Rice Woodworking in Arizona. The wood used for this bed is Douglas Fir and Sugar Pine. There are four elegant shades of wood stain finish to choose from; Jacobean, Weathered Oak, English Chestnut and Golden Oak. If you are looking to give your bedroom a rustic decor then this is an excellent choice. The styling of this bed is modern with a retro-rustic feel. The only drawback with this product is that it takes between 21 to 30 to manufacture and ship. But the end product is so enjoyed that you let go the shipping time. This is one of the most liked and most positively reviewed pieces of furniture on our list. Apart from this, the manufacturers also have received high appreciation in terms of communication and being friendly. Home Styles brings in the Aspen Collection that consists of a king size bed and a nightstand. This collection is more modern and less rustic. Though this set will add warmth and light ambiance to your country home or farmhouse. Finished in cherry veneers and mahogany solids the bed and the nightstand go well with the deeply carved frames on the headboard and footboard. The bed is made sturdy with the use of high-quality wood and looks good with the antiqued brass hardware. The whole collection needs to be assembled by you; instructions are provided and enough screws and bolts are included with the set. It’s no rocket science with all the information provided. There is a matching drawer chest to complete the rustic bedroom set, you can view it here and you can purchase an extra nightstand too. If you fancy a tall piece of furniture, this rustic drawer chest is 54″ in height and comes with 5 drawers. It is perfect to store your clothes, cosmetics or any items to keep safe. It comes with non-snag interiors and side-roller glides. The drawer is made of solid wood with rustic pine grain veneers and brass tone handles. This is a lovely piece of furniture that will suit a rustic or country styled bedroom. Very little self-assembly is required and there is an option to have the drawer assembled for you at an extra cost. The unit comes on a pallet, so if you feel like making something out of the pallet you can. There is also a matching nightstand and drawer dresser that you can check by clicking on the links. The thing I love about the rustic decor is that you can combine woods and metals to achieve a truly unique look to your home. This bed has that 19th century feel to it and makes you wanna buy it the minute you look at it. The Nottingham Spindle Bed comes in dark antique bronze finish with a classic metal bed design. The bed features a footboard and a six spindle head. If you have a bedroom that has a more earthy color scheme, then this bed will really blend in and finish the rustic Victorian look for you. Little self-assembly is required to set this bed up and the instructions provided are enough to do so. However, if you are skeptical about assembling the bed yourself, you can always pay extra to get the assembled version at the cost of few bucks. Sizes Avail: Full – Double / Queen / King. The 6 chest drawer by Coaster Home Furnishings ensures ample storage. This rustic dresser has a lovely black and medium oak finish that typifies the rustic country look and exudes transitional style. Made from real wood, this dresser is sturdy and pretty heavy. The dresser feet are tapered and the rounded knobs are painted nice black to complete the look. The top drawers are felt lined for jewelry and valuable items. Not only does this look good in a cozy primitive looking bedroom, but it can also be used in your regular bedroom. It is a very handsome piece of furniture one can own. Very little self-assembly is required or you can pay extra for the assembled version. There is a matching rustic mirror to complete the dresser and mirror set that you can view it here. Cedar Furniture brings to us the typically homey cabin style looking bed. It is made of 100% natural northern white cedar. This bed is perfect for a cottage, bed & breakfast style country home, a cabin in the woods or even in your farmhouse bedroom. This Queen size Slat bed comes with a log footboard, log headboard and heavy-duty metal side rails. It is finished in a creamy white color and is made of pure cedar wood logs; hence the log look. You can have the assembled bed option or you can do it on your own. Assembling this bed is smooth and effortless. Whichever option you pick, you are not paying anything extra. There is one thing you need to take care is cleaning the logs when you unpack. They might come a little dusty. You can apply a coat of varnish for extra care or you could just leave the bed alone looking natural in its color. The last pick for our 8 best rustic bedroom furniture, we have chosen this raw looking 4 drawer chest made of wood as well as laminated pressed wood. It is very heavy and has safety stops in the drawer. The drawers are also equipped with metal runners. For the rating of 4.2 of 5, this piece of furniture by Sauder Dakota Pass is highly recommended by users on Amazon. With maximum positive reviews, the users have much more to say about the product as well as the manufacturers. Light assembly is required for setup and there is also an option to have the drawer pre-assembled at an extra cost. The drawer is made from pressed wood and has a wonderful rustic simplicity to it. To complete the look, they are also offering a nightstand, a 6 drawer dresser, a headboard and an armoire. Visit the Sauder Dakota Pass for more. How about a rustic dining table or rustic coffee table for your living room, dining room or bedroom? Read my rustic dining tables and rustic coffee tables guide here! Rustic is defined as “simple, artless, or unsophisticated.” Yet, none of these terms apply when you are talking about rustic décor. In fact, the terms “fancy, stylish, and earthy” come to mind. Rustic furniture purchased or made in a variety of colors and styles is unique and can be tailored to the personality of the homeowners. Rustic furniture is timeless since it features solid construction, durable hardware, and gorgeous finishes. When decorating a home with rustic furniture, the rooms will feature various textures, styles, and appeal that no other furniture style can give. Because the furniture is built and designed to last a lifetime, protecting your purchase is imperative. Many people overlook the need to take good care of their rustic furniture purchase. The care is simple but very important. Unless the furniture is properly cared for, it may warp, rot, crack, or get scratched. These tips will help you keep your rustic furniture looking good for a long time. Dust your rustic furniture with a soft, smooth clean cloth to which water or furniture polish has been applied. Never dust using a dry, rough cloth on your rustic furniture. Using soap and water will warp your furniture over time. Removing dust keeps the particles from scratching the surface of the piece and protects the wood stain and finish. Every time you dust, use the same type furniture polish. Using the same product will ensure that no streaking or cloudiness occurs. Apply a small amount of polish on your rustic furniture. Too much polish harms the surface and finish. Be sure coasters are placed under all drinks and vases. When condensation, spills, or water rings appear, clean them up immediately. Rustic furniture absorbs liquids quickly. When glasses and cups stay in direct contact with the wood, ring-shaped stains develop quickly and are often permanent. When water is on the rustic furniture, be sure to grab a soft cloth for cleaning up the mess. Any rough materials will scratch the surface. Always use a hot pad or trivet as a protective layer between warm dishes and the surface of the furniture. Without this protection, spots may form and damage the wood’s stain and finish. Keep your rustic furniture out of humidity. When rustic furniture is in a humid environment, the wood will expand and contract. This will mar the finish or can cause the joints to become loose and unstable. Sunlight may also damage rustic furniture. The strong rays can cause the finish as well as the wood itself to deteriorate over time. Following these tips on caring for and protecting your rustic furniture ensures that your rustic tables will last and provide make your home the elegant, sophisticated place you love! I hope you enjoyed my article on rustic bedroom furniture? If you did please leave a comment below.